Biographical information for Barbara Fant. Barbara Fant, originally from Youngstown, Ohio is a minister, poet, and artist facilitator. She received her bachelor of arts degree in English Literature and Language Arts in 2010 and her Master of Theological Studies in 2012. 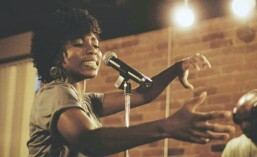 She has been on three National Poetry slam teams from Columbus and has represented the city in four Individual National and World Poetry slam competitions. Her first poetry collection, Paint, Inside Out was released in April 2010 from Penmanship Books of New York City when she was awarded The Cora Craig Award for Young Women Authors. She is a former employee of the Huckleberry House and of Art for a Child’s Safe America, working in shelters, prisons, correctional juvenile facilities, and elementary schools teaching art as a form of healing. She is also a member of ArtFluential of REACH communications, Is Said and the Advance Party, and has also been a regular performer on the radio show Street Soldiers. Commissioned by The Columbus Foundation, her poem “Today, Beginning Again,” written for Columbus’s Bicentennial year can be found in Revealed: Columbus, The Story of Us. She works at The Columbus Foundation as the Nonprofit Outreach Administrator. Barbara considers poetry her ministry and currently worships and teaches at The Way Columbus church in Reynoldsburg, Ohio.